Tucker is a 10 week old German Shepherd puppy whose owner contacted me for in-home dog training in Armonk NY. Tucker’s family are experienced dog owners, so they understood the importance of early puppy training. As with most puppy clients, we focus on housebreaking, puppy biting/mouthing, leash walking, and beginner obedience training. This is only Tucker’s first time learning the “Place” command. “Place” teaches him to go to his dog bed on our command. Early puppy training is SO important. Look how well he is doing on his first day! Tucker is so happy and playful Tucker at the end of our training. A happy, healthy, and well-behaved dog should be the objective of everyone’s training! 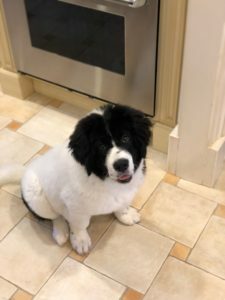 Meet Maggie, a SUPER cute, happy, and intelligent Landseer puppy. Maggie is only 13 weeks old, but her family are experience dog owners, so they understand the importance of early puppy training. 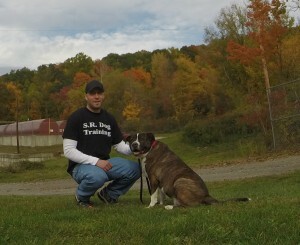 Maggie’s owner’s contacted me for my premier at-home dog training in Armonk NY. 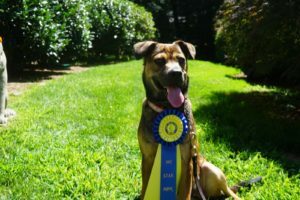 In just our first training session, we covered my very successful housebreaking protocol, how to address puppy biting and chewing, and started her on Beginner Obedience Training. Hunter is a friendly, happy and energetic 1 year old male Boxer. Typical of Boxers, Hunter is intelligent, easily excitable, and has endless energy. Based on these attributes, it was apparent to his owners that they needed to begin in-home dog training in Armonk NY. Boxers are not considered to be fully mature until they are three years old. They have the longest puppyhood in the world of dogs, and Hunter’s boundless energy and inquisitive mind, made training necessary. Hunter’s owners both worked full-time, and were out of the home for most of the day. So implementing a precise and predictable exercise program was paramount. Hunter loved walks, but was not the easiest to walk on a leash. Within just 1 training session we were able to make the walk a more comfortable and enjoyable experience for both Hunter and his owners. This enabled his owners to take him on at least (2) ½ hour walks per day. In conjunction with daily walks, scheduled play sessions like tug or fetch as additional outlets for his pent up energy. As the old saying goes, “A tired dog is a good dog”. In conjunction with a structured walk, learning How to Play a Structured Game of Tug with Your Dog is very helpful. In order to provide Hunter with mental stimulation and a productive outlet for his mental energy, we began my complete obedience training program. When looking for dog training in Armonk NY, make sure to use an obedience training program that is simple, safe, and effective. Hunter responded great to the positive motivation in the forms of play, praise, and treat rewards. Reliable obedience can be achieved with any dog, regardless of breed, age, or size. Once these changes were put into place, a new Hunter emerged. He remained happy, friendly, and energetic, but his owners were now able to productively harness that energy and have him reliably listen regardless of distractions. Not only can they enjoy his playful side, they can also enjoy his sweet, even-tempered, and laid back side as well. 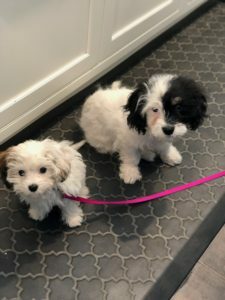 Buddha and Gypsy are the perfect Cavachon puppy duo who are learning obedience training, housebreaking, and overall better manners. They are both learning: Come, Sit, Down, Drop It, and Stay. These are important fundamentals for all dogs to learn, regardless of breed, age or size. I am so proud of how well they are exceling! Contact me to learn more. 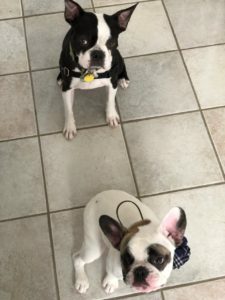 Harper and Gatsby are two French Bulldogs who’s owners enlisted my help with their training. 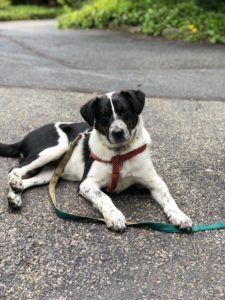 Harper is an 8 month old female, who was having frequent housebreaking accidents in the home and would bite, jump, and bark at anyone who would come in the home and even when their owners played with them. Molly is a happy and friendly 5 month old rescue puppy. Here she is relaxing after our first obedience training session. Molly’s owner lives on 12+ acres in Armonk NY, so it’s critical to them that she learn to “Come” when they call.